Have you heard the story of Naaman the leper? He served as commander of the Syrian army in the time of the kings of Israel, and was prompted by one of his servants to seek out a prophet who, it was rumored, could heal him of his leprosy. There’s quite a bit we could say about that story, but suffice it to say that God did indeed heal Naaman (after teaching him a lesson or two in humility). What I really want to talk about, though, is what happens after that healing. Upon returning to Elisha, Naaman proclaimed, “Indeed, now I know that there is no God in all the earth, except in Israel” (2 Kings 5:15), and then proceeded to ask Elisha for “two mule-loads of earth; for your servant will no longer offer either burnt offering or sacrifice to other gods, but to the Lord” (2 Kings 5:17). 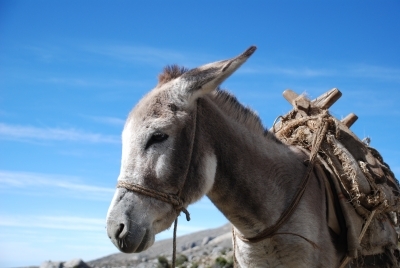 So why did Naaman want two mule-loads of earth? Was he just terrible at collecting souvenirs? (“Look, kids, I brought you a present from Israel! It’s your favorite! Dirt!“) Was he trying to start a garden at home and having a hard time working with the unbalanced PH levels of his local soil? Was it his intended contribution to the next meeting of the Syrian Topsoil Enthusiasts Club? Actually, in the ancient world, it was a common belief that all gods had a sort of limited geographical range in which they could operate. The more you strayed into the territories of rival gods, the less powerful your deity of choice would become. Just like with real estate, the number one rule in pagan worship was location, location, location. That’s why we see Balak moving Balaam from mountaintop to mountaintop in an attempt to curse Israel (Numbers 22:41 – 24:10). Balak supposed that if Balaam was unable to curse Israel from one mountaintop, his God probably just needed a better vantage point to work from. It’s also the reason why the ten plagues were so humiliating to Egypt’s pantheon (Exodus 12:12). For a foreign God to singlehandedly cripple Egypt without opposition was a distressing proof that this God of Israel was not to be trifled with. And that’s why Naaman wanted dirt. He had seen the power of Israel’s God, but he had only seen that power in Israel. Even with his newfound belief in the one true God, his upbringing still told him that although God was powerful here, there was no guarantee of that strength extending all the way to Syria. In his mind, his best hope of taking the God of Israel with him was to take a little bit of Israel itself with him as well. That might sound strange to us today. After all, we know that God is the God of the whole earth (Isaiah 54:5) and that He remains the same “yesterday, today, and forever” (Hebrews 13:8). But does that stop us from sharing in Naaman’s belief? How many times have we, like Naaman, placed an arbitrary limit on God’s capabilities? Just because we believe that God can be everywhere doesn’t keep us from illogically concluding that God either cannot or will not intervene in some specific instance in our lives. Elijah, Elisha’s predecessor, relied on God while he opposed and defeated 450 false prophets, but turned tail and ran after receiving a death threat from the queen (1 Kings 19:2-3). For whatever reason, he decided that the same God who had sent down fire from heaven could do nothing do deliver him from the wrath of one angry woman. How often do we do that? How many times do we set our own imagined boundaries on what God can or cannot do? How often do we convince ourselves that God requires our help in delivering us? God does not have blind spots, nor does He have weaknesses. The only limits that exist on His mighty hand are the ones we imagine there ourselves. There is no location, no scenario where our Father in heaven is powerless to deliver us from whatever enemy threatens to overpower us. “For He Himself has said, ‘I will never leave you nor forsake you'” (Hebrews 13:5). 6 Responses to "Two Loads of Earth"
I found this very interesting .The explanation of it extremely good. Thank you for this great article as it opened my understanding a bit more. I ,sadly to say , did not notice the part about the dirt nor would I have understood his reason behind wanting to take some of it back with him. Sometimes our Bibles do not explain things of this nature as being written back in certain times people would have understood his reason clearly where in our day I would not have at all. I am amazed at how our Father will open a truth to us when we need to understand something from Him , but this just goes to show that when He knows we need to learn something He will make sure we find it and see,read or hear it when He is wanting to tell us something. Mine is to learn to stop trying to limit Him. Thank you again for this wonderful article. Jeremy, excellent lesson. Thank you for sharing something that we need to know. Love your Sabbath Thoughts…….so well thought out and written. Keep writing!!! Jeremy what an insightful story. What an impactful insight with that additional piece of background knowledge. It just goes to show, that no matter how long we have been baptized, there is always something to learn. I truly don’t remember hearing that before, and it really improves the understanding of Naaman’s account, as well as the others you mentioned. Loved it!